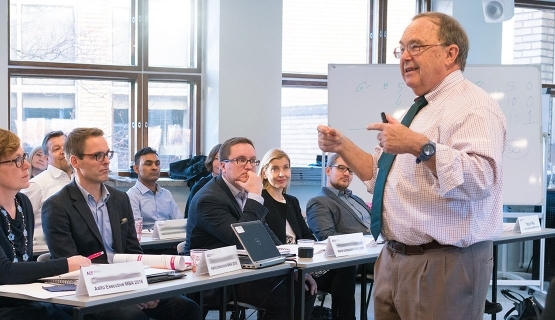 Professor Ron Dulek has been a highly regarded teacher of communication at Aalto Executive MBA since 2002. According to alumni, Dulek has a knack for making learning easy – and delivering messages that stick. “EMBA participants don’t tolerate things that are not useful. 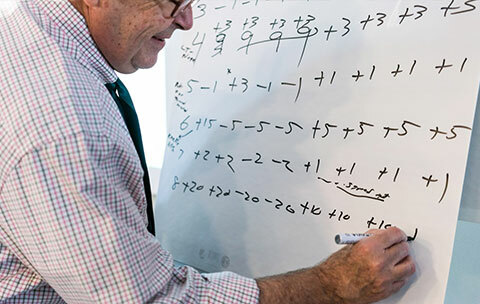 Students care about application, and rightly so,” Dulek explains his teaching philosophy. “Teaching is never about me. It’s about my students and the fun of learning. Participants face tremendous demands on their time, and I have no right to waste it. Things need to be organized and pragmatic,” he adds. After years of teaching communication at Aalto EMBA, Ron Dulek asserts that it is complete nonsense to claim that Finns have poor communication skills. When Dulek first started teaching communications at Aalto EMBA back in 2002, he knew very little of Finland, but he felt right at home. For most of the year, Dulek lives in Alabama. Each summer, his wife and he spend two months at their summer house in South Africa, completely off the grid without so much as even a cellphone. Despite his preference for warm climates most of the year, Dulek is no stranger to the cold. Born in Minnesota, a stronghold for Swedish immigrants, Dulek’s childhood was laced with memories of snow and subzero temperatures. Dulek teaches a communication system based on four basic notions – humility, courage, resilience, and optimism." 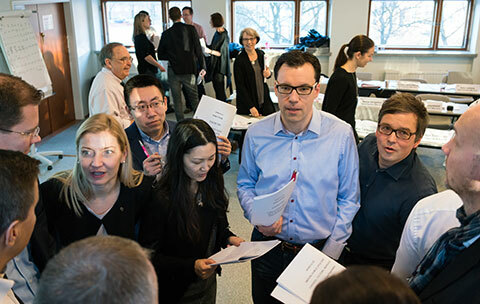 At Aalto EMBA, Dulek teaches a communication system based on four basic notions – humility, courage, resilience, and optimism – upon which you can start building core communication competences such as structure, style and stickiness. “The system includes strategies for communicating in ways that cater to your needs. At times you wish to be memorable and make sure your message sticks. You may wish to deliver a forceful message with impact. There may also be times in business communication when you want to deliver a message that will soon be forgotten,” Dulek describes. Back home at the University of Alabama, Ron Dulek has been voted MBA / EMBA teacher of the year eighteen times – and you would be hard-pressed finding an Aalto EMBA alumnus with anything other than praise for Dulek. Dulek, in return, has a great deal of good things to say about Aalto EMBA participants. He emphasizes that he has rarely left a class without learning at least as much as he has taught. “I’ve benefitted enormously from getting to teach at Aalto EE. Before, my communication system was too U.S. based. The participants at Aalto EE have taught me international adaptability and provided insight on how the system works in other countries,” he states. “Another important lesson I’ve learned has to do with how language shapes society. English language is very status conscious. In Finland people are not judged in the same manner based on language use, and the society is much flatter,” he contemplates. Dulek also praises Aalto EMBA participants for teaching him valuable lessons about the benefits of diversity. 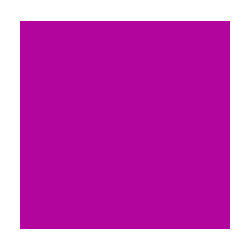 “A typical Aalto EMBA class in Helsinki will have participants from Finland, Sweden, Norway, Russia, Latvia and so on. They have amazing openness and the class is better because of the different views,” he says. “I have also taught Aalto EMBA classes in Singapore and seen this same phenomenon. There is immense diversity of people and it is marvelous witnessing the respect everyone shows each other and the way students share their ideas. Diversity teaches,” he affirms. During the years that Dulek has taught at Aalto EE, technology has revolutionized communication. While technological headway is making communication easier than ever, messages have become much more concise, first due to emails and later thanks to Twitter and other social media. “Technology is already communicating for us. Our iPhones read our emails and suggest suitable responses. Last December in Helsinki, I presented participants with eight passages, of which four were written by a human and four by software. Nobody could pinpoint the origin of all eight passages correctly. Software has become that good,” Dulek underlines. But whereas technology is progressing, Dulek says he has mixed feelings regarding how communication in general is evolving." But whereas technology is progressing, Dulek says he has mixed feelings regarding how communication in general is evolving. “The forceful, attacking style we see used on social media? Historically we have never been that publicly rude in business, but I fear the repercussions of examples set by people like Trump. Communication styles in general may be changing. It is too soon to tell,” he ponders. Although he worries that social media rage may influence communication styles at large, Dulek has an optimistic outlook of years to come. “We can see tremendous changes in every sphere of life. In a sense one might fear we are entering an age of abdication, with self-driving cars and other such technological advances. But I like to take a brighter look at things. I think we are living a new Renaissance, we just don’t realize it yet,” he says with a smile. Watch Ron Dulek’s TED talk “How to sit with elephants”. This story is part of Aalto EMBA 30 years series. You can find the other stories of the series below. Read more about Aalto Executive MBA.